UPPER WEST SIDE — Big Nick's is bowing out. 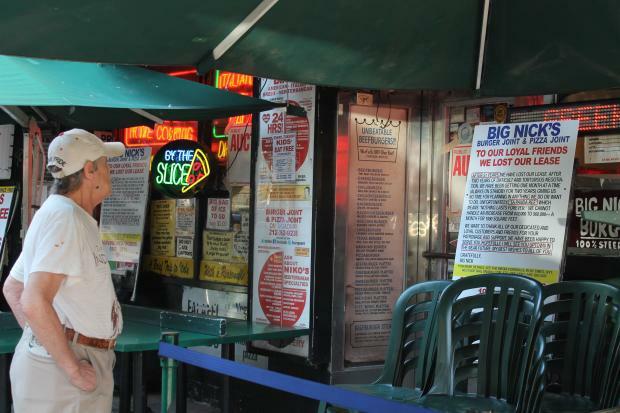 The 51-year-old neighborhood favorite Big Nick's Burger Joint and Pizza Joint closed Monday morning, with a sign to customers posted outside saying the eatery at West 77th Street and Broadway could not afford a rent hike. "We cannot handle an increase from $42,000 to $60,000++ a month for 1,000 square feet," wrote owner Nick Imirziades, citing a failed two-year-long lease negotiation that he described as "difficult and torturous." Lophijo Realty Corp., the owner of the building that houses Big Nick's, did not immediately respond to a request for comment. "It's a shame — it's a New York institution," said local resident Steve Greenwald, 70, who said he'd ordered in burgers or had gone to Big Nick's for years and appreciated the restaurant's value. "This is what's happening on the Upper West Side. Places keep closing. It will probably be replaced by a chain." Hundreds of commenters lauded Big Nick's on its Facebook site, with nostalgic musings on their favorite dishes — from chicken parmigiana to simple bacon, egg and cheese on a roll. Many said the closing marked a loss of New York City's heart and soul. "The very best of Old NYC is slowly going away due to greed, and it makes me really sad," wrote Diane Russell. Imirziades could not be reached for comment, but in his sign to patrons he referenced a possible relocation "uptown," without getting into more specific plans. One possible new location could be somewhere between West 96th and West 100th streets, Imirziades told the West Side Rag. Last summer, the City Council passed a resolution to limit the size of stores along Columbus and Amsterdam avenues as a way of keeping out large chain stores and protecting mom-and-pop businesses.